Step 1: Take one cup of nuts and place in a glass bowl or a canning jar. Add two cups of filtered water. You can add 1/2 tablespoon of salt at this point if you like. Soak overnight or for 7-8 hours. This step breaks down the phytic acid you don't want and gives you healthy nuts. Step 2: Dry your nuts in either a dehydrator if you want super healthy nuts, or bake in your oven at the lowest temperature until dry and crunchy. Super tasty!! The low temperature of the dehydrator allows the nuts to keep their healthy enzymes intact. You can skip this step if you want to make a nut butter instead. *Note: This works well on most nuts. However, cashews, flaxseed, and chia seeds are the exception to this rule. They like to get gummy when soaked. Step 1: Take your dried nuts and place in a food processor or nut grinder ( I like to use the Bosch Meat Grinder with the #2 disc) if you are lucky enough to have one. If you have our KitchenAid High Speed Blenders or high-speed type blender, those will work as well. Step 2: Process the nuts. At first you will end up with nut flour. Keep going. The nut flour with start to get gummy and turn into to nut butter. You may need to scrape down the sides of your food processor at this point. Process until all the nut flour is turned into nut butter. 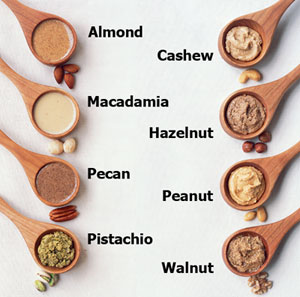 *If your nut butter seems rather dry, you can add a little oil to get to the right consistency. Also, if you skipped the drying step of the nuts, expect your nut butter to be more on the runny side due to soaking the nuts. Step 3: Add salt or sugar, if desired. This step makes it taste more like the store bought stuff we are used to. I usually just eat mine plain, but the kids like it better with the salt added. Once you have your nut butter, grab a spoon and dig in. Or, take some of your dry peanuts and head off to the circus! Hope you enjoy! Do share how the show, I mean the recipe, goes for you and how you used your peanuts! !